Yesterday was Earth Day: a perfect time to talk about hypermiling and reduced emissions. But I’m not going to. You see, if we really try, we can do even better than hypermiling. In fact, focusing exclusively on driving more efficiently is not always the best approach. After all, it assumes that you will always be driving. Also, there are stories about people literally driving farther than necessary just to make sure their engines warm up so they can register better mile-per-gallon averages. Today we’re going to shift our focus from driving more efficiently and focus on driving less. There are several approaches to reducing our dependence on our vehicles. This article might not get to them all but hopefully it will serve as a good start and get you thinking. The most obvious alternative to driving is walking. OK, I know what you’re thinking: “I live too far from work” or “I have to haul things” or whatever. Yeah, I get that. I have those things too. Walking is not an all-or-nothing alternative. The point here is not to walk everywhere all the time. The point is to know your walking speed and acceptable distance. Then, when you have to get yourself from one place to another, ask yourself whether it is within your acceptable distance. If it is, seriously consider walking. On a more personal note, we have become a sedentary society. We sit in our car, at our desk, and in front of the television. No matter who you are or what your current state of health might be, we can all benefit from taking more steps every day. Stepping up from walking is riding a bicycle. The same concept applies: know your acceptable distance and situations. If the current need fits your parameters, ride your bike. From time to time, someone at the local fitness center will wonder why there are so many parking spots and so few bike racks. This is a perfect example of when to ride your bike. Not only does bicycling extend the distance and shorten the time compared to walking, mountable carriers allow for light grocery shopping. If you need to run to the local store for a few things in order to complete the recipe, don’t bother firing up the vehicle; hop on your bike. Some of us are lucky in that we have coworkers who live within a mile or two of our homes. This makes carpooling pretty convenient. Some companies have bulletin boards where people can post interest in ride sharing opportunities. Some are actual bulletin boards in a common area such as the cafeteria whereas tech savvy companies might have information on their intranet. When it comes to driving less, any improvement is an improvement. Let’s say you have a coworker who lives halfway between you and work. Even if you drive to their house and park your car, you are not driving the entire trip. Even if the coworker lives a few miles out of your way, the fact that you are not driving every day means that you are driving less. Of course, carpooling means taking turns. Don’t be a carpool leech! The only acceptable exception is that you do not have a car at all. Some people have mass transportation options and don’t even realize it. Make sure to check your community’s internet site or other information to see what mass transportation options exist. Some people place a stigma on riding the bus or train. Their belief is that not rolling up in your own set of wheels somehow makes you less of a person or they see mass transportation as a lower form then car ownership. But these people are spending money on gasoline and potentially on parking fees. They log more miles on their car, which will result in faster wear-n-tear maintenance. They aren’t aware the amount of money they are spending just because of their personal belief. Those who ride the train and/or bus to and from work do not have to drive in the rain or snow. They save money on gasoline and potentially parking fees. Ridding as a passenger is much less stressful than driving and provides ample opportunity to get a little more work done, sit quietly, or catch up on that podcast. Have you ever been our in your car running a few errands and realize that you’ve crossed town twice already and will need to do it again? Hopefully, it occurred to you that had you planned your errands a little better, you wouldn’t have to do so much driving around. Not only does better planning reduce the miles you log in your car, it saves you time and money. You save time because, of course, you spend less time in your car. 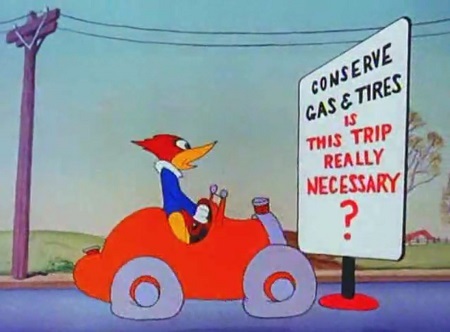 You save money because gasoline is not cheap. Next weekend – or whenever – when you are about to run a series of errands, consider writing them down and then numbering them based on a preferred route. You would be surprised how much time you end up saving this way and how much better you feel for having gotten through them faster. Reducing the miles driven in your car by any amount is an improvement. Even if carpooling and mass transportation are not available in your area, you can still find other ways to drive less by biking and walking from time to time. Here is my biggest rub. I pulled these tips from international sources. These things are tightly integrated into the very fiber of most Europeans. Trains and buses are used to capacity and many companies have as many bike racks as parking spots. Some European companies charge their own employees for parking in their garage as a way to encourage carpooling and mass transportation. Sadly, these things are usually either ignored or rebuffed by most American citizens. I shutter to think how bad things would have to get before more people here started acting more like the people over there. I already do what I can of the above. But living “in the country” leaves much of it out of my reach, just like many others. We are a large country, and “local” can mean completely different things to people that live in a city and those that do not. While I admit it is by choice, it is a choice I will happily make. I don’t mind visiting large cities, but that’s not a lifestyle I would choose long term. But it does reduce my choices on a future EV. A Leaf only be useful as a second car, not the primary choice. A Bolt or 3 is finally getting to the point of *possibly* being a primary car, but only if an adequate charging infrastructure is there (the 3 fits, the Bolt will not unless GM comes to its senses), or I rent a car more often than I’d like. Like many others, I am still waiting for the next leap in battery technology that has been hinted at for decades. I know it will come, I just wish it had already.